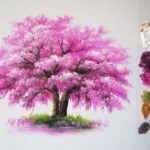 How to paint trees in oils and acrylics step-by-step for beginners. Our videos can help you paint trees that look like trees. Trees come in all sizes and shapes colors. The light striking the tree changes hourly and daily. Impressionist artists sought to capture the moment but it is so hard to do art of the moment because the moment changes. The tree is a moving subject subtle variations you may find it hard to capture. You must remember that there are many shades of green and that there are more colors in the tree than green. The shadows are more blue green and sunlight creates a more yellow green in trees. Tree trunks Brown white and a mixture of black or dark. Since red is the complement of green, red should appear in the shadows of the trees. Consider the natural form of the limbs. They do not come out of the trunk adjacent to each other. It is helpful to paint the shadows and the green at the same time as well as the sky. Remember that the shape of the limb can come by painting limb then sky then limb then sky. You can achieve the shape of the limb by painting it too thick and erasing with sky.